VATICAN CITY (AP) — Pope Francis said Saturday that darkness and fear must not prevail as he concluded a bleak week in Europe with a message of hope during an Easter Vigil service in St. Peter's Basilica. Francis entered the silent and darkened basilica with just a single candle guiding him at the start of the vigil. As he reached the altar, the basilica's floodlights flipped on in a symbolic show of light after the darkness of Jesus' crucifixion. In his homily, Francis said the hope that Easter brings is a lesson for the Christian faithful to cast aside the hopelessness that can "imprison" people inside of themselves. "We see and will continue to see problems both inside and out. They will always be there," he said. But he insisted: "Let us not allow darkness and fear to distract us and control our hearts." The lengthy vigil service includes a papal baptism for 12 adults hailing from around the world. A few hours after it ends, Francis will preside over Easter Sunday Mass and offer his annual Easter blessing. 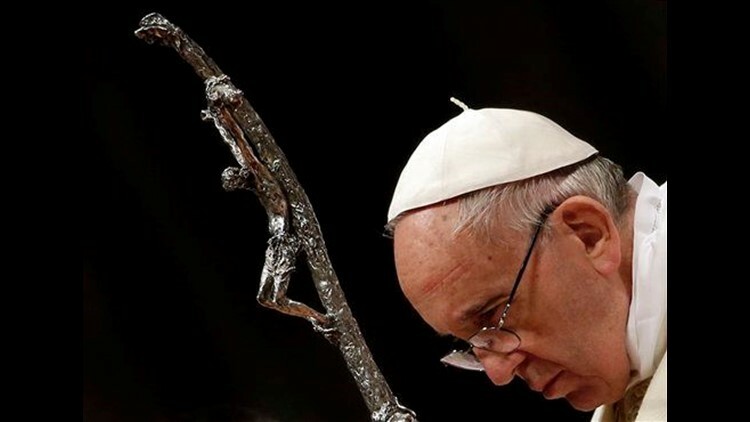 Francis' message of hope followed his bleak condemnations on Good Friday and earlier in the week of the attacks by Islamic extremists in Brussels and elsewhere. During remarks Friday at the Colosseum capping the "Way of the Cross" procession re-enacting Jesus' crucifixion, Francis denounced the "terrorist acts committed by followers of some religions which profane the name of God and which use the holy name to justify their unprecedented violence." While the pope was at the Colosseum, his chief alms-giver was out on the streets of Rome giving out sleeping bags to the homeless Friday night in a show of papal support for the city's least fortunate.